The latest edition of the 2009 roster has two transfers from Syracuse. Dan Sheeran a 6-3 211 pd WR who will be a RSJr in 2009. He has had six total catches for the Orange during his career. A Frank Ordonez/Post Standard image. The Post had this to say: "Sheeran was moved from wide receiver to linebacker on the second day of spring practice. He missed the beginning of last season with a broken leg. Sheeran would have been a junior in the fall. His profile has already been removed from the SU Athletics Web site." Sheeran's 2006 Rivals page here. His NFL DraftScout page here. Also joining the Minutemen is Mike Mele a 6-0 218 pd LB. A 2006 Scout.com article on Mele joining Syracuse here. He's mentioned in this article about several players leaving the Orange. At Syracuse, Mele had 46 UT 55 AT 101 TT 1.5 TFL. Both players probably left Syracue because of diminished playing time under new HC Doug Marrone. Both players should be excellent additions to the Minutemen roster. Mele should add a strong presence to a LB corps that returns only one starter. He seems to have a great motor and the defense needs that after last year. Sheeran has size and speed. He could be in the mix for a starting spot in 2010. David Driver of the Springfield Republican has an article about this year's UMass Team: "UMass football team expects better". Jeromy Miles states in the article that UMass' softness against the run last year hurt the defense's pride. 2008 was an anomaly in UMass run-defense history. More from Matty Vautour on Liam Coen joining the Manchester Wolves. If Liam is not playing professionally this fall, some college-level team should snap him up as a graduate assistant. Coen would make that team better. Matty also has an article on UMass being picked second in the CAA North preseason poll. I listened to the CAA audio feed yesterday. Most of the broadcast crew picked UMass third behind UNH and Hofstra. In the article Matty relates NY QB Will Fiacchi expected an offer from UMass. Remember I have already blogged about Fiacchi. UMass has a photo gallery from the event here. A Google news search on "CAA football" this morning produced links to 21 articles. Click here for list. Sometimes I'm so good I scare myself :) On July 24th I read this post on the New Hampshire Football Report and thought to myself "Than might be a place for Liam". Yesterday, Liam Coen joined the Manchester Wolves. UMass press release here. Former UMass Coach Don Brown get a mention in this review of Maryland. Matt Lawrence was the first player on the field for the Ravens at their camp. Lawrence gets a favorable mention here: "Always hustling." Brandon London brings "A unique talent" to the Dolphins roster. London is also mentioned here. The CAA released their preseason poll and preseason All-CAA teams here. UMass is picked 2nd in the CAA North and received seven first-place votes. Tony Nelson, Victor Cruz and Valdimir Ducasse were picked on offense and Josh Jennings and Jeromy Miles were chosen on defense. More on the CAA's 2009 TV schedule here. Twenty-three CAA games will be available for the well-equipped fan. BTW, today is the CAA Media Day (starts at 10:00am). Follow the news here. More updates to the Buchanan Award and Payton Award lists. Kansas State's Bill Synder will be interviewed for the Big Twelve Media Day today at 9:00 am (Central time?). NESN has a long article about former UMass star Brandon London who is trying to make the Miami Dolphins roster again this year. London's Miami bio here. He also has a Wikipedia page. London is also being considered for a reality show. UMass did not make the Princeton Review's top 20 party school list. 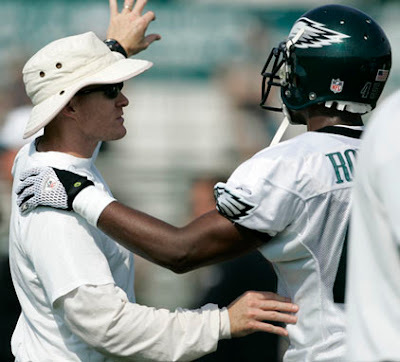 Courtney Robinson at the Eagles training camp. A Rich Schultz/Special to The Morning Call image. Dave Coulson reviews the Missouri Valley conference for 2009. Mike Barber of DNR online has an article on the CAA's 2009 television package. Forty days from now I'll be in Manhattan, Kansas waiting for the UMass-K-State game to start. It's been a long run without football. The Bleacher Report talks about the light at the end of the college football-less tunnel. Josh Buchanan has a list of "Top 100 FCS NFL" prospects. Vladimir Ducasse is up the the #2 prospect in FCS/I-AA. You have to register/sign in to view the article. New CAA team Old Dominion won't be playing FBS/I-A teams anytime soon. This article discusses the Eagles defensive backs. Former UMass CB Courtney Robinson is mentioned. Tickets to the UMass-Kansas State game are on sale here. David Coulson says that Richmond won't be the favorite to win the CAA South this year. Every game of the Montana Grizzlies will be televised this year. Montana sells out their stadium, so television does not hurt attendance. The article talks about coverage on Dish Network, but those are local channels, not national feeds. More on WRHU's CAA's Media Day coverage. Keeper's College football ratings (just about the only FCS statistics guru), has his 2009 FCS forecast up. He also has UMass #13 in his 2009 preseason schedule rank and #11 in schedule difficulty. Note that the CAA has six of the top eleven schedule difficulty slots. WWLP has an article on Tony Nelson and Jeromy Miles being added to the Payton and Buchanan Award Watch list. Anyone remember William L. Putnam, who gave WWLP its call letters? 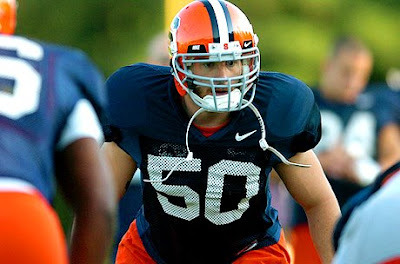 Today's blog post by Draft Daddy has a "Top Small School Linebacker" NFL prospects. UMass fans will get to see three of the top seven. More on the CAA Media Day from the CAA website. WRHU usually provides live streaming audio of the event. As reported by blog reader "Dennis Dent" the latest interation of the 2009 roster is up. Missing is DT Raymond Jones. Remember Head Coach Kevin Morris will be chatting online at 10:00am through the UMass website today. The new FCS website JBscouting.com has an interview with UMass OT Valdimir Ducasse. You need to register to read the article. There's a Rivals three-star quarterback from Georgia available. This 2003 Kansas State football highlight video has (I think) at least one play from the UMass-K-State game that year. The CAA website will have audio and video from next Wednesday's CAA Media day. The event will be held in the ESPNZONE at Baltimore's inner harbor. I was just there last week! ESPNZONE is the next building to the left in the row of brick buildings behind the aquarium. UMass RB Tony Nelson has been added to the Payton Watch List by the Sports Network. UMass fans will see another nominee Albany RB David McCarty on September 12th when the Great Danes visit McGuirk. The Sports Network has also added UMass Senior Safety Jeromy Miles to their Buchanan Award Watch List. Two other CAA players are on the list: Delaware DB Charles Graves and and Villanova LB Osayi Osunde. The UMass website has a long article about six UMass football players being named to the Phil Steel preseason All-CAA team. 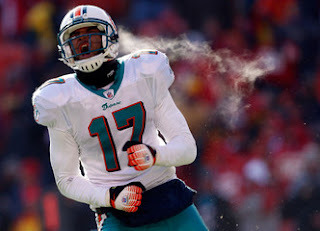 Named were Victor Cruz, Tony Nelson, Vladimir Ducasse, Josh Jennings, Jeromy Miles and Kyle C. Harrington. Phi Steele's entire preseason All-CAA team is here. UMass ties Richmond for the most first team selections. UMass fans will have a chance to e-mail questions to new UMass head coach Kevin Morris this Friday at 10:00. Former UMass star Marcel Shipp gets a mention in this article. It looks as if the NCAA may soften its stance on Delaware Colleges and Universities hosting playoff games. The NCAA had previously stated that because the state of Delaware had approved sports betting, Delaware schools would not be allowed to host games. That would have made a huge impact on CAA schools. Home teams went 10-2 in the first two rounds of last years FCS/I-AA playoff games. 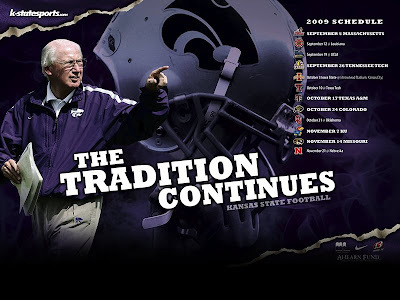 The Kansas State 2009 football poster. The CAA has a consolidated 2009 football schedule with TV information here. This article over on Bleacher Reports predicts five first weekend upsets. Two of them are FCS teams over FBS teams and two of the others include Maryland and Miami, two I-A teams UMass fans have an interest in. •During eight of the nine weeks before the start of preseason practice, student-athletes may be involved in voluntary weight training and conditioning activities. •Supervised strength-and-conditioning activities are limited to eight hours a week. •All strength-and-conditioning coaches overseeing these activities must be certified in CPR. •A member of the sports medicine staff must be present at voluntary conditioning activities. •Practice that is organized or financially supported by a member institution is prohibited during the summer. * from an article by Natalie Meisler in the Denver Post. First off, a big "Thanks" to all who wished us a good trip. Here in New Hampshire we have had non-stop rain this season. In Baltimore, we had showers only on one afternoon. The Boston Globe has a story by Monique Walker about All-America candidate Nate Thellen of Northeastern and his brother and current UMass RFr Darren Thellen. Josh Buchanan a frequent contributor to Draft Daddy, now has his own "Small School" ---- FCS website. Speaking of new websites, check out College-Football Mid Major Madness. It has ten blog posts by "umass09". Another new website covering FCS is the new, and somewhat mysterious, FCS Now Blog. Dave Coulson gives preseason news and predictions for the Big Sky, Southern Conference, and Great West Conference. Temple has cut ties with two players from their Spring Roster. No indication what the nature of the offense was or if he'd be eligible, but Junior Galette could be an impact player at the FCS level. Travel from Kansas City International Airport (code "MCI") to Manhattan is 130 miles via Interstates 435 and 70 (70 mph speed limit). Part of I-70 is the Kansas Turnpike (about $2.35 each way). Air connections from KC to Manhattan ("MHK") are limited at the moment. You might want to check air connections later this month as some additional connections thru Texas are being added. Topeka is a good second choice for hotels and is 55 miles to the east via I-70. The Wanamaker Road corridor on the west side of the capital city is replete with lots of hotels and dining establishments. Parking lots at the stadium open 5 hours prior to kick-off. The lots around the stadium are reserved. Lots across the street offer plenty of parking between $10 and $20 per car. Visiting teams generally book into the The Holiday Inn (Anderson Ave., Manhattan), the Capital Plaza in Topeka, or, in Junction City, the Marriot depending on the preferences of the respective coaches and ADs. My suggestion would be for you to contact your football office for that info. Expect many, many tailgaters and lots of barbecue and music in the parking areas." The Salem News has an article about Chris Zardas' senior year. The Blog believes Chris could be an impact player if he's healthy. Zardas went 23-138 6.0 AVE 4 TD in 2008. The article mentions the possibility of Zardas getting a fifth year of eligibility. If that were to happen, it would really help blunt the impact of the loss of Tony Nelson. Hi everyone. I've just been too busy to up date the blog. There is some news to talk about, but I'm planing on getting into that when I return on Monday morning. Under the category "People---- idiots or what". Yesterday we drove down to the National Zoo in D.C. I-95 was eight lanes of solid fast traffic. Side of us was a young woman --- texting. No hands on the wheel and looking down, not at the traffic. See you Sunday night or Monday morning. "Hello" from Baltimore. I do have an internet connection. A quick check shows no significant UMass football news, so I'll try to do a more detailed search tonight or tomorrow. 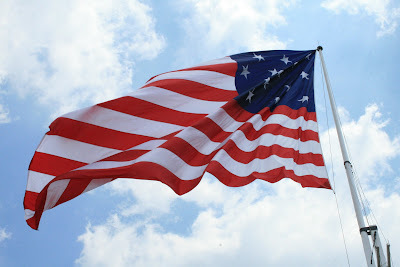 Should you ever visit Fort McHenry, try to time your visit for Noon. Mrs. Blog and I (plus about forty other people) got to take part in the raising of the BIG flag over the fort. It measures 42 by 30 feet. Two rangers supervised and everyone cheered when the Flag went u p.
The small image is a file photo, because I could not take any images while holding the flag. The big image is by me. Click on the image for a full-rez view. Gotta go. Mrs. Blog is yelling for me to stop playing on the computer. 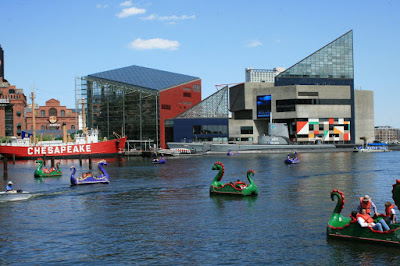 Going to the National Aquarium and other inner harbor stops. Mrs. Blog and I are off for a week to the Baltimore-Washington area for some R&R. The place that we are staying is supposed to have wireless internet. If I have a working internet connection, I will try to update the Blog on a time available basis. No posting at all means I do not have an internet connection and the Blog will return on 07/19 when we get back. 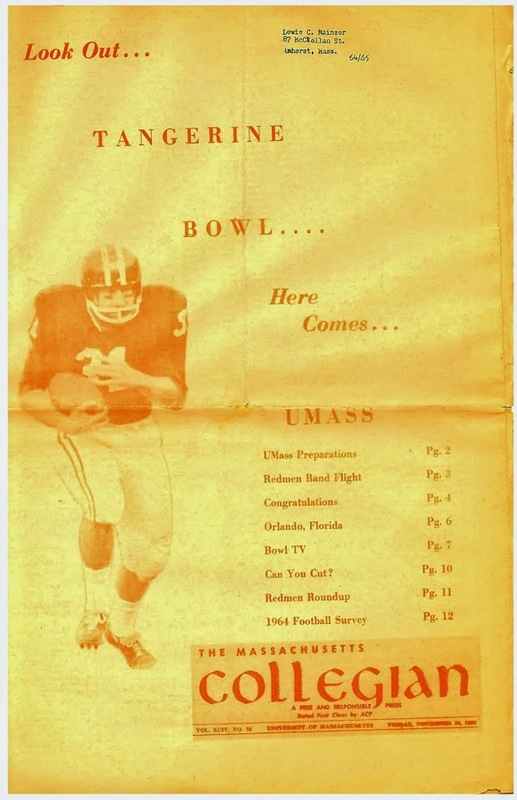 UMass was the only team to offer Framingham QB Danny Guadagnoli. He's 6-1 200 pds. Guadagnoli threw for 2,600 yards and 25TD's last year. He added 600 yards rushing and 15 TDs on the ground. The Maine Black Bears have a long history of sending players to the NFL by means of the free agent route. Maine's Jared Turcott a 6-2 232 pd powerback has that written all over him. Boston College has been doing more recruiting in New England this year. Article brought to my attention over on the "Eagle in Atlanta" blog. Both the Springfield Republican and Matty Vautour have UMass football articles up, both contain nothing I haven't already covered. The Springfield Republican is here and the Hampshire Gazette is here. The UMass athletic dept has an article about Vladimir Ducasse and Jeromy Miles being picked as pre-seaon All-Americans by Sports Network. Matty does have a nice link to a North Jersey article about Marcel Shipp. Shipp has been a class act everywhere he's gone. Hopefully, he'll be involved in UMass football somehow if he's truly out of professional football.
" We do know, however, that fellow Kansas State wide receiver Brandon Banks ran a blistering 4.27 at his pro day. Banks was given a draftable projection, despite his glaring lack of ideal size -- 5' 7", 151. " We'll be seeing Mr. Banks shortly. Things are getting weird for Delaware WR Mark Duncan. Anyone going to the Kansas State game had better get working on their motel reservations, or they will be staying forty miles away in Kansas City. David Coulson picks the Sports Network's Preseason All-America teams. Vladimir Ducasse and Jeromy Miles both made the second team. I'm sorry to say Western Carolina had a player die during a summer voluntary workout. The 7/10 issue of Draft Daddy has list of Senior "Small School" Safety NFL prospects. Jeromy Miles is second on the list. DD.Comment: "At this point, Schillinger and Miles are clearly the top two prospects in the group above. Both are considered latter round type prospects, but have the potential to move into the middle rounds with strong senior years and good post-season workouts. Big East transfer Andrews also has some draft potential, but needs to prove he possesses next level speed." If you missed it, ESPN signed a contract to cover BCS football games starting in 2011 ------ for a half a billion dollars. This article from a Norwalk newspaper talks about five Norwalk football players who will play in the Hall-of-Fame classic this Friday. D.J. Morrell a 6-7 320 pd OL will play for Dean College this fall. He's getting looks from Boston College, Temple, Bryant, Iowa and UMass. Morrell's Rivals page here . Rated as one of the top ten players in CT. Another article about him here. Joining him at Dean will be another Norwalk senior Jeremy Dickens a 6-2 210 TE/DE who is drawing interest from Temple, UMass and Central Connecticut. A Dean College punter chooses Clemson over UMass. The Sports Network has started their list of Payton Award Watch list. The first four (of twenty) are here. They're doing the same thing for the Buchanan Award Watch list. The first four defensive players are here. The New Hampshire Football report blogs that Dartmouth has dropped UNH from their schedule after this year. That will leave only the Rhode Island -- Brown game as the last remnant of the old Yankee Conference- Ivy League series. Phil Steele has UMass as #19 in his preseason poll. Today's Draft Daddy post has a list of top "Small School" cornerbacks. No UMass players on the list but fans of the Minutemen will see Stony Brook's Chris Williams and James Madison's Scotty McGee at McGuirk. David Coulson has the latest edition of his "Around FCS" column up and considers Steve McNair's Paradoxical Life. I've blogged before that a number of FCS football conferences are not holding Media days this year because of budgetary woes. Mrs Blog and I have plans to go to the UMass-Richmond game this fall. This year will be the last year the Spiders will play in City Stadium. They've got some special events planned. #ESPN's College football live will cover Kansas State today (Tuesday). The show will be aired at 2:30, 4:30 and 6:00 pm. The Orlando Sentinel ranks the College Football Preview Magazines. Tampa Bay.com takes a look at life after football for offensive linemen. "Vladimir Ducasse ~ Massachusetts -- Is 6'5", 330 pounds and very agile. Grew up in Haiti, but moved to Connecticut in high school. Some scouts project him as a future N.F.L. guard." 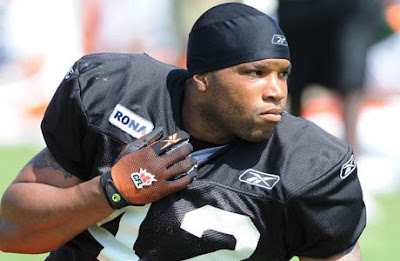 Anton McKenzie's BC Lions bio page here. His UMass bio here. Another story about him here. UMass legend Steve Schubert's daughter is General Manager of th e Manchester Wolves arena football team. This blog has a number of times about Steve Schubert. This article was brought to my attention over at the New Hampshire Football Report. Kansas State will be running the 4-2-5 defense this year. You've probably already heard, but Steve McNair was shot to death yesterday. This story focuses on his time at FCS/I-AA Alcorn State. Matty Vautour has an article on former UMass punter Christian Koegel's stint on Real World Cancun. I'm not a reality show fan, so I haven't seen it. A lot of the people on these shows are actor wannabes, so it may lead to an acting career for him if he's interested in that sort of thing. Via the New Hampshire Football Report, Jordan Johnson a CB from Springfield Mass signed with Brigham Young. He had offers from UNH, Northeastern and Bryant. Kansas State star DT Jeffery Fitzgerald was arrested for DWI. If he gets suspended for a couple of games, UMass is likely to be one of them. Click on image for a hi-rez view. 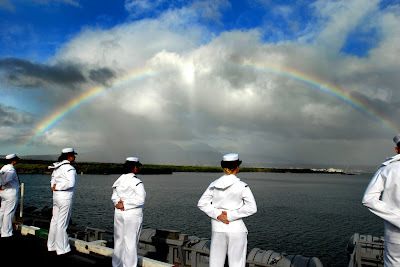 The image of a rainbow over Pear harbor is by PO3 Chelsea Kennedy. No UMass news on the wires today. So I'll just wish everyone a safe and happy Fourth of July. I checked the US navy status site and there are 192 US Navy ships and 25 submarines under way today. That's 46% of the fleet. Yawin Smallwood a 6-4 225 pd LB from Worcester has committed to UConn. He had received an offer from UMass. Brenden Barrett, a kicker from eastern Mass who drew attention from UMass will walk on at Ole Miss. NFL Draft Scout has a list of the top 750 2010 NFL Draft prospects. I received my copy of the Phil Steele's ACC & Big East regional college football magazine through the mail yesterday. He has over a 100 pages on FCS including 11 on the CAA. Steele picks UMass second in the CAA North behind Hofstra (?!). Former UMass player and coach Joe Cullen has been added to the staff at Idaho State. Former UMass assistant coach John Zamberlin is HC with the Bengals. Before we start, it's apparent that someone in New England has pissed off the weather gods. I want that person to apologize right now! Scott Wallace QB. See this article. C.J. Burnley RSFR CB. The depleted CB position gets even smaller. Korrey Davis SO TB. I've already blogged about Davis' transfer to Liberty. Adham Talaat OT FR. The only loss out of the 2009 recruits. Ryan McMackin FR. OL. Coming off one year at Milford Academy.He was 2nd team All-Class C New Jersey in 2007. Played in the New York/New Jersey Governor's Bowl. Theo Agnew FR DL. New Haven Register All-State in 2008. Caleb Violette FR K/P. VA Preps All-Virginia team in 2007. Walk-on at Virginia Tech last year. The Charleston Gazette has a long interview with retiring Marshall AD Bob Marcum (mentions UMass a couple of times). In Monday's blog post, I report on BCS/I-A transfer Justin Roper's considering UMass. The Minutemen did not make the final two for the services of the Oregon transfer. Kansas State is ranked high in an "easy OOC" schedule poll. Highest percentage of returning letterman in the CAA*.